Text messages can contain important details that need to be noted down. If you engage in business, your clients could just send text messages regarding business meetings and transactions. Companies that engage in money transfer business usually send text messages containing tracking number or transaction codes. This information is important because the money cannot be claimed without it. Aside from text messages relevant to your business, you might also want to keep personal messages from friends and loved ones. Opening and reading them from time to time might serve as an inspiration. But what if you have accidentally deleted the information before you have noted it down? Numbers are difficult to remember and to make sure that you have accurate information, it is necessary to open the text message again. You need to recover the message you have deleted but the question is it possible to retrieve message from your Motoroloa device? Many users of Motorola phones think that once they have deleted a text message, it is gone forever. However, this is not true. You cannot open the message anymore but it is just stored somewhere in your phone's memory. However, once you have deleted a message, contacts or photos, refrain from using your phone first. If your memory is already full, chances are your old message will be overwritten and you lose the chance to retrieve it. 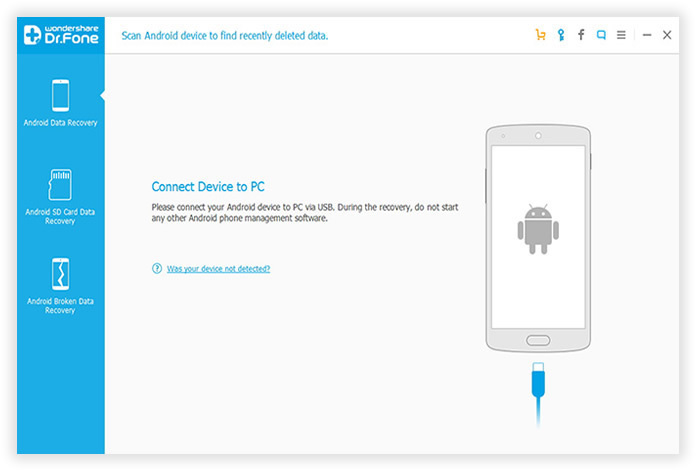 For sure recovery of text messages, Android Data Recovery is highly recommended. A tool that is considered the best instrument to use to recover data lost such as text messages, contacts and photos. It can be able to save you out from data loss when you delete important data accidently, data was gone after rooting, device corrupted and more. It can deeply analyze your device and recover up to 13 file types. The steps are easy to follow. You need only your Motorola phone, a computer, and a USB cable. Connect your mobile phone to the computer using the USB cable. Note: Keep in mind that you should stop using your phone to avoid the original data being overwritten. First of all, launch the program after installed on your computer ( Windows or Mac are available ). Then connect your Motorola phone to computer uing USB cable. You can see the main windows like below. 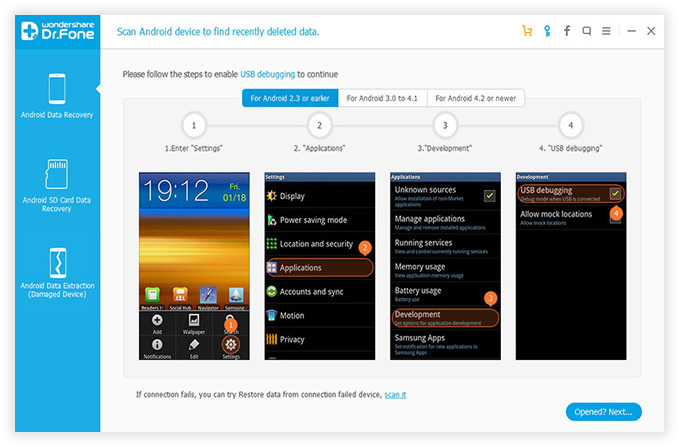 If your device can't be identified by the program successfully, you may be required to enable debugging on your Motorola device, check what OS version your phone it is then simply follow the instruction displayed in the image below. You would only need to empower the program to scanning phone's internal memory. Look at your home screen of your phone. Click "OK" on your Motorola device to allow the program super user authorization when an app Superuser Request pops up. 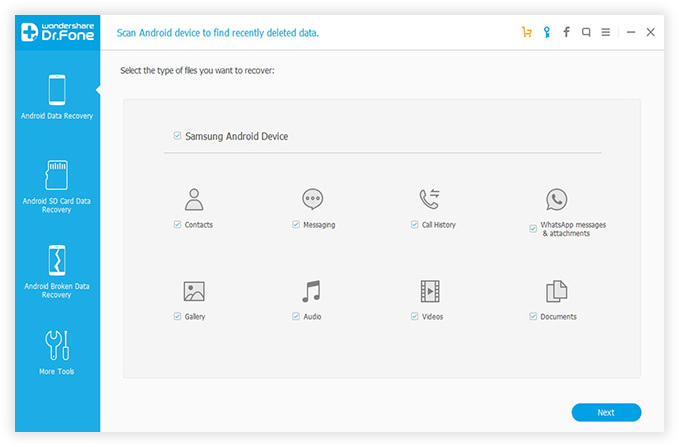 To save your scanning time, you can then select the target type of data you would like to scan. If you only want to recover messages, then mark the "messages" tab. just mark them and click " Next" to proceed directly into the next step. Then the program will start to deeply scanning all deleted messages from your device. 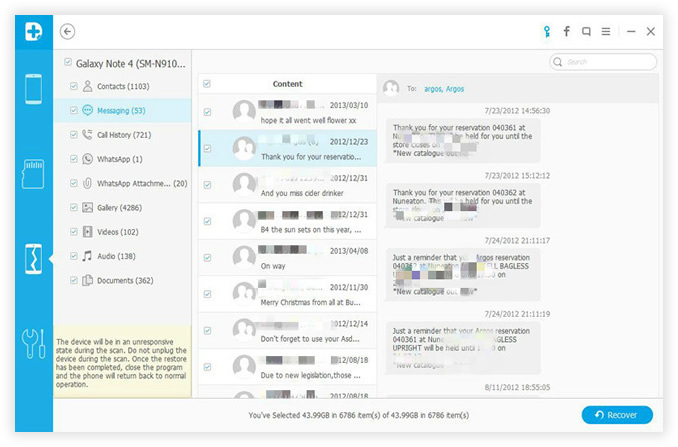 The whole scanning process will take a few minutes based on the size of your data, after the scanning, all the lost messages will be scanned and displayed categorically for you to select from, including all lost and exiting messages. Once you have checked or marked the items you want to recover. Click the 'Recover' button to recover your data to your computer and save as Xml, Text or Word format. To experience the convenience of using this powerful tool, you can download a trial version for free from the site. After your have downloaded it, you just follow the steps given and you will be amazed at how it is able to recover all data you thought were gone forever. If you feel satisfied with the result, you can purchase the full version so that you can use it whenever you need to recover some data. Aside from retrieving text messages, it can also restore deleted photos, contact list, WhatsApp Messages, calendar, and other files that you prefer to keep on your Motorola. Stop worrying about losing important files due to accidental deletion. 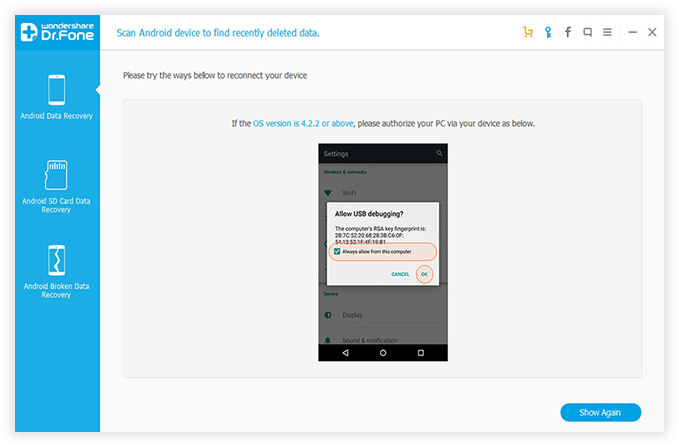 Try the Motorola Data Recovery tool and be protected from losing important text messages and other files that you keep in your mobile device.